PALO ALTO, CA--(Marketwire - October 1, 2007) - Having fewer resources than major labels and stars, independent music labels and artists are always looking for new ways to connect with and expand their fan base. And thanks to BUZ Interactive™, the leader in voice personalization services, they now have a whole new communications and revenue channel at their disposal. Voice Messager is the first application of its kind, playing personalized greetings and messages containing independent (and mainstream) music to visitors to any Web page. Independent labels and musicians can use the Voice Messager application to welcome visitors to their MySpace, Facebook or any web page with a custom voice message featuring their own music. Fans from anywhere in the world can leave an artist a public or private voice message. Artists can choose to have messages automatically delivered directly to their cell phone voicemail. Voice Messager makes it easier for artists to keep in touch with fans because they can listen to and manage messages both online or from a cell phone. Artists can also make their songs available on GETaBUZ. GETaBUZ users can use the music in the greetings on their Web pages, in messages they send to other people's Web pages or cell phones (such as birthday or holiday greetings), or in their own voicemail greeting on their cell phone. The use of music in greetings creates a whole new channel for musicians to monetize their music, reaching both an online and mobile audience worldwide. BUZ also offers artists a powerful promotional tool by distributing recorded audio messages on an artist's behalf to fans' cell phones and Web pages. Messages are delivered directly into cell phone voicemail without the phone ringing, as with all BUZ messages. Voice Messager is available now free at http://www.getabuz.com for use on MySpace, Facebook, Friendster, Tagged, Piczo and Blogger, or any Web site. Artists can upload their music to use in their first personalized welcome greetings on their Web page and cell phone voicemail at no charge. Additional greetings with uploaded music will cost $0.49. Artists or labels interested in making their music available on GETaBUZ or promoting their music or themselves through audio messaging should email info@buzinteractive.com. 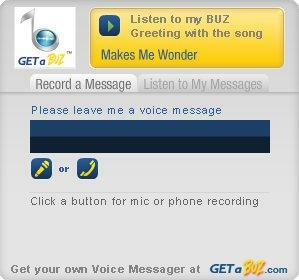 To leave a BUZ for the GETaBUZ team and see Voice Messager in action, go to http://www.getabuz.com or http://www.myspace.com/getabuz.